Discussion in 'Transformers Fan Art' started by Razorrider, Jul 8, 2010. Here's something different, an Autobot/Decepticon two-character pic. Bubble Man is an Autobot because I sympathise with him. In the song Bubble Man, I'm Bubble Man! , he is apparently very lonely wandering the oceans because he is unable to function properly out of water and longs to be on dry land. Perhaps he can be buddies with Seaspray and Cosmos then. I've based his body off the new Seaspray as well as G1 Scourge due to the structure on his head. Metal Man is a Decepticon because for one thing he looks the part, despite his Autobot-like colors. Another reason is that the song Metal Man, Made of Metal makes me think of Metal Man as a "bad boy" type of character. He is based off BM Obsidian and Animated Megatron, as the toy of Obsidian has rotors that resemble Metal Man's buzzsaws. What toy is Bubble Man's figure based on? G1 Scourge? Awesome, Bubble Man is just about perfect! 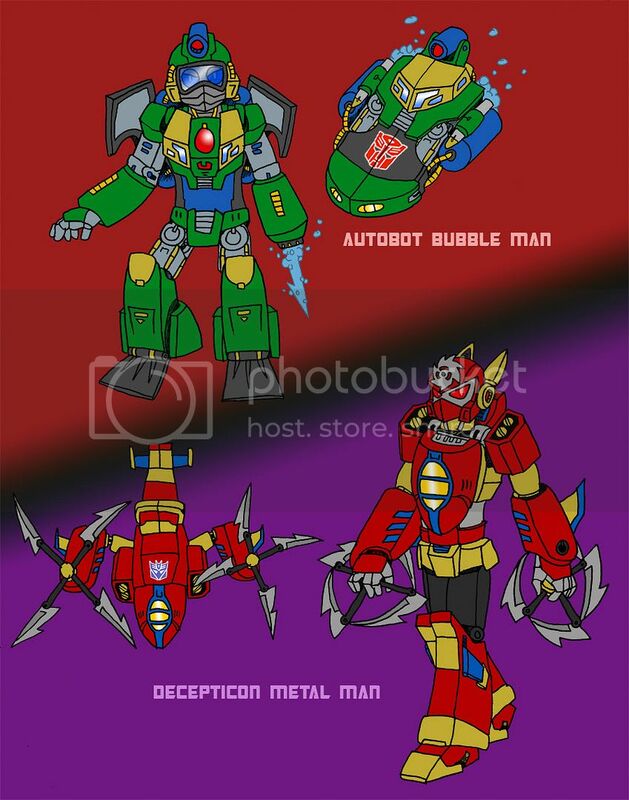 Bubbleman reminds me of HFTD Seaspray, which I think is cool.